Tamiya 78028 US Battleship BB-62 New Jersey 1/350 scale kit! This is a 1/350 scale assembly plastic model kit of U.S. Battleship BB-62 New Jersey. It includes detail parts to further the realistic scale appearance in model form. The USS New Jersey (BB-62) was the second ship of the Iowa-class and was completed in 1943. She participated in a long list of actions from WWII until the end of her illustrious career in 1991. 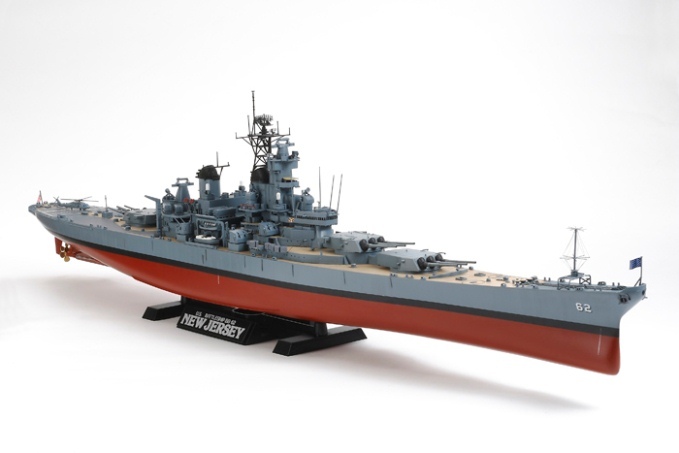 This 1/350 scale plastic assembly model kit of the U.S. battleship New Jersey was originally released in 1984 (Item 78005) and is now available with a set of detail parts to enable the creation of an even more realistic model of this famous battleship.